Connor Williamson and Felix Evangelho appeared in a touring show about youth homelessness in 2017, The Invisible Boy, as part of the annual Listen Up! theatre project. A new show on healthy relationships and sexual violence is seeking applications from interested teenagers. Now entering its 4th season, the Burning Passions Theatre’s Listen Up! 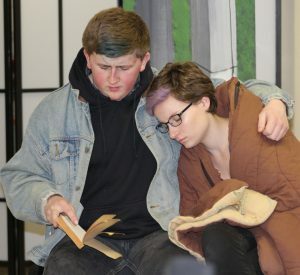 youth project will be touring Lanark County later this spring with a new play whose message is perfectly in tune with the #MeToo and #TimesUp phenomena. The company is currently seeking applications from teenagers who would like to be part of the play, as well as schools that would like to have the troupe perform for their students. “Before #MeToo even sprang up in its current form, we were planning to do a play about what constitutes healthy relationships,” explains Laurel Smith, the Artistic Producer of the company, which also runs the summertime Classic Theatre Festival. Since 2015, Listen Up! has created plays that speak not only to teenagers but adults as well, spurring dialogue on how best to bridge the generational gap on a range of issues from anxiety, depression and teen suicide to gender fluidity and youth homelessness. Each performance is followed by a facilitated talkback in which the performers discuss issues with audience members, addressing not only the roots of the problems, but focusing on solutions as well. Burning Passions Theatre has toured its shows in schools, youth centres, and at a national conference in Ottawa. Each year, the company has seen positive results inspired by their shows, from improved self-esteem of participants to change sin the community. For example, its show on teen suicide, Jessie’s Song, inspired the YAK Youth Centre to offer a two-day Applied Suicide Intervention Training (ASIST) course for the public. Each of the staff and placement students at YAK are now certified in ASIST as well as Mental Health First Aid. Similarly, last year’s show, The Invisible Boy, helped raise awareness of youth homelessness in a rural context, and was accompanied by a United Way representative sharing resources for young people at risk of finding themselves with no roof over their heads. Anyone interested in being part of this year’s play, which begins development and rehearsal in February and will tour towards the end of April – can send email to burning@web.ca or call (613) 264-8088.